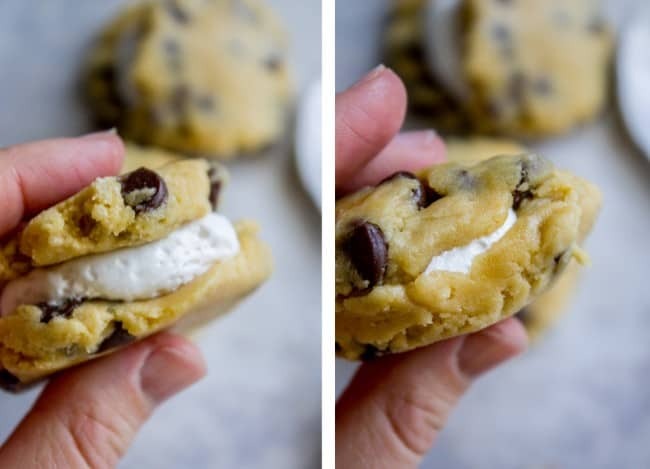 Classic chocolate chip cookies stuffed not with a marshmallow, but with marshmallow creme! 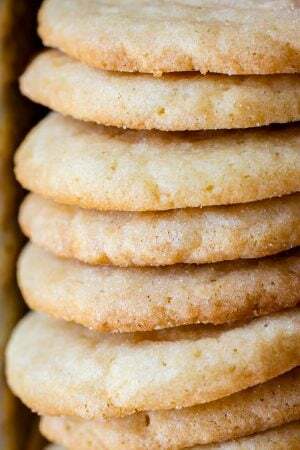 It makes the cookies so soft and chewy on the inside, and there is a perfect crisp on the edges! And thus began my obsession. He was right of course: marshmallow and marshmallow creme are totally different. 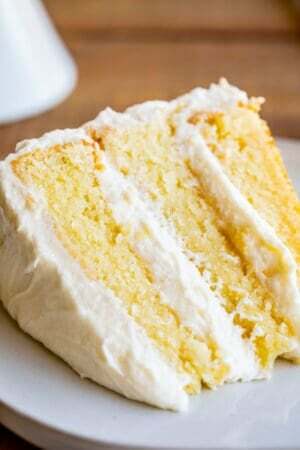 Creme is not solid at room temperature; it’s the consistency of thick, gooey frosting. 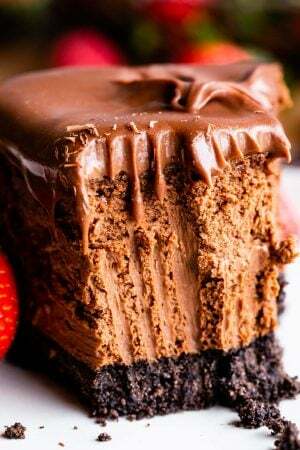 (In fact I use it as a frosting on this Mississippi Mud Cake << so good.) 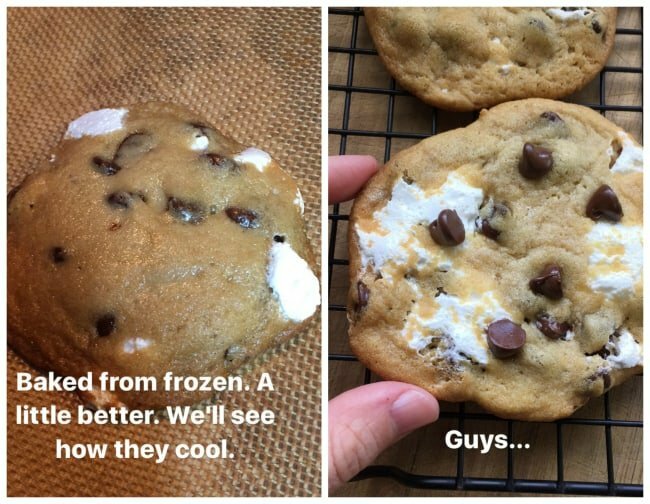 I could not wait to try it inside a cookie. But it didn’t work out quite as expected…about 7 times in a row. My Instagram Story followers got to (had to?) hear all about the many, many failures I had in my attempts to make these cookies work. Wanna see? First I tried to freeze dollops of marshmallow cream, just like I froze little nuggets of Nutella to go inside these Nutella Stuffed Browned Butter Blondies. (<< Have you made those yet??) It didn’t go over so well. They just flattened into little pancakes before freezing. And then melted everywhere when baked. (Refrigerated marshmallow creme works best). I tried a few other cookie recipes but finally just came back to my tried and true. 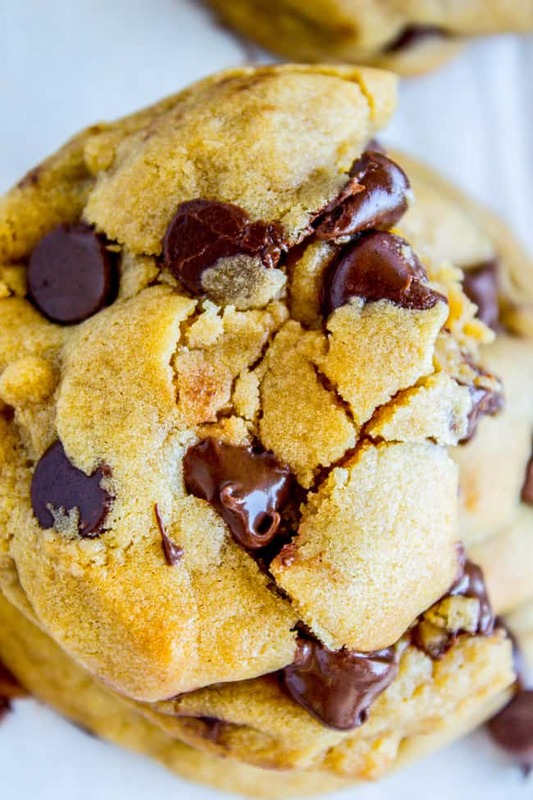 The first chocolate chip cookie recipe I published on this blog was back in 2012: My Favorite Chocolate Chip Cookies. I think the reason it worked is because there is shortening in the recipe (butter-flavored Crisco is the best.) 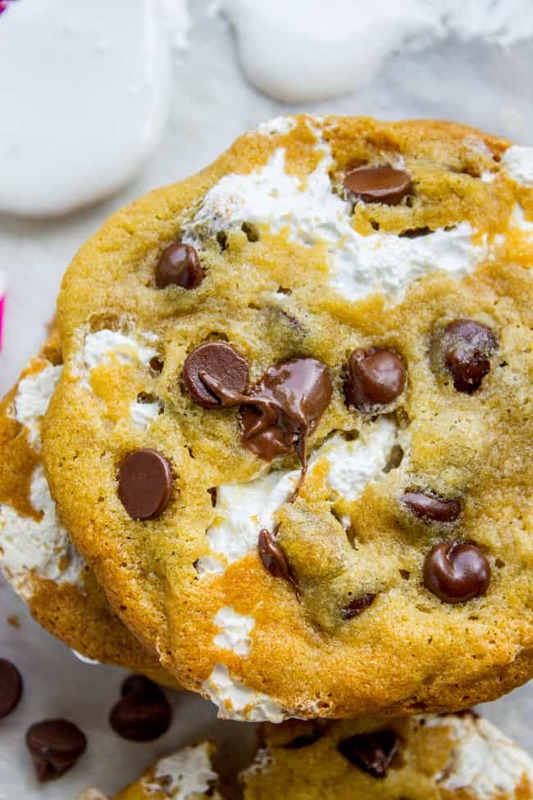 It holds it’s shape better, and since all marshmallow wants to do is erupt like lava and spread your cookies into flat discs, shortening helps them keep their cookie shape. They are not the puffiest cookies in the world, but they are SO CHEWY in the middle. (Just like these Texas Cowboy Cookies.) Isn’t it great having all kinds of cookies to love?? You guys HAVE to let me know if you try these! A recipe that takes me this long to get right turns into a little marshmallow cookie baby, and thus becomes close to my heart. Share it on Instagram using the hashtag #TheFoodCharlatan so I can see it! I love that. In a large bowl or stand mixer, cream the butter until it is light and fluffy. Add the shortening and beat well for 1 minute. Add the granulated sugar and the brown sugar, beat for 1 minute. Add 3 eggs and 1 tablespoon vanilla. Beat until well incorporated, scraping the bottom and sides. Add 4 and 3/4 cup flour that has been spooned into the measuring cup (not packed or scooped). Don't stir. Use a small spoon to stir the baking soda and salt into the flour, then stir the flour in. When there are still streaks of flour in the mixture, add 2 and 1/2 cups chocolate chips. You may need to switch to a wooden spoon at this point if you have a wussy mixer. Don't over mix!!! Stir until just combined. 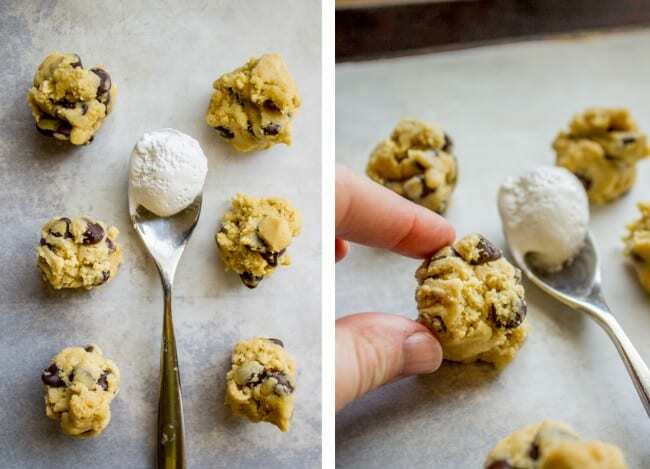 Use a tablespoon to make 2 balls of dough. Flatten them out with your hands to form a disc. Use a small spoon to scoop a generous teaspoon of the cold marshmallow creme onto one of the discs. See photos. Place the other disk on top and use your fingers to pinch the edges and seal the marshmallow inside. Use more dough to "patch" it if there is a leak! Make sure all the marshmallow is covered or you will have marshmallow lava all over your baking sheets. 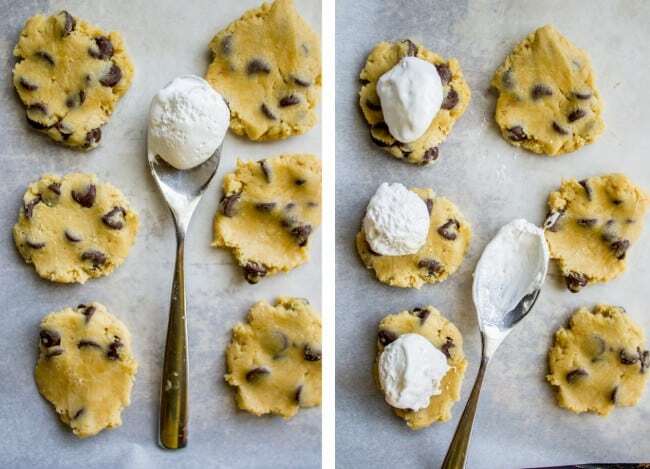 Place the dough on the cookie sheet. 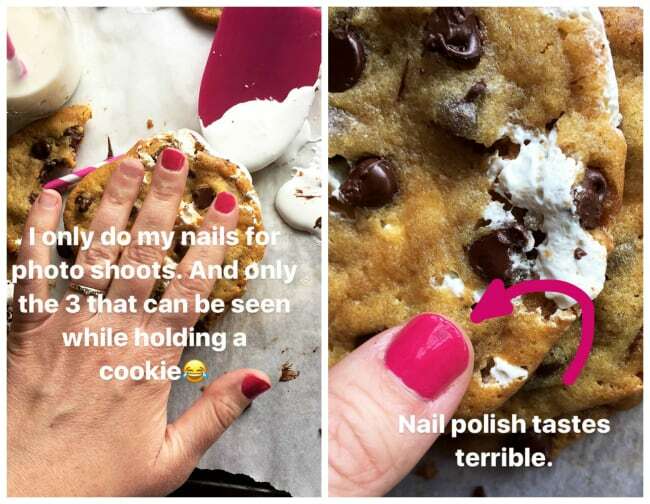 Make sure there are at least 2 inches of space in between each cookie. Bake at 350 for about 10-12 minutes, until they are golden on the edges and still a little shiny on top. 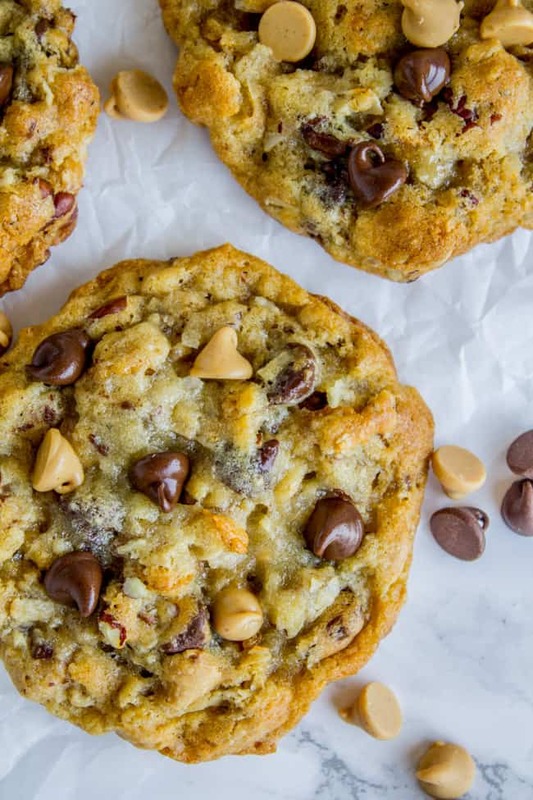 Source: I adapted these from My Favorite Chocolate Chip Cookies, which are an old classic. Texas Cowboy Cookies << I just made these again the other night. I forgot how amazing they are! Used Rice krispies instead of corn flakes, it worked great. 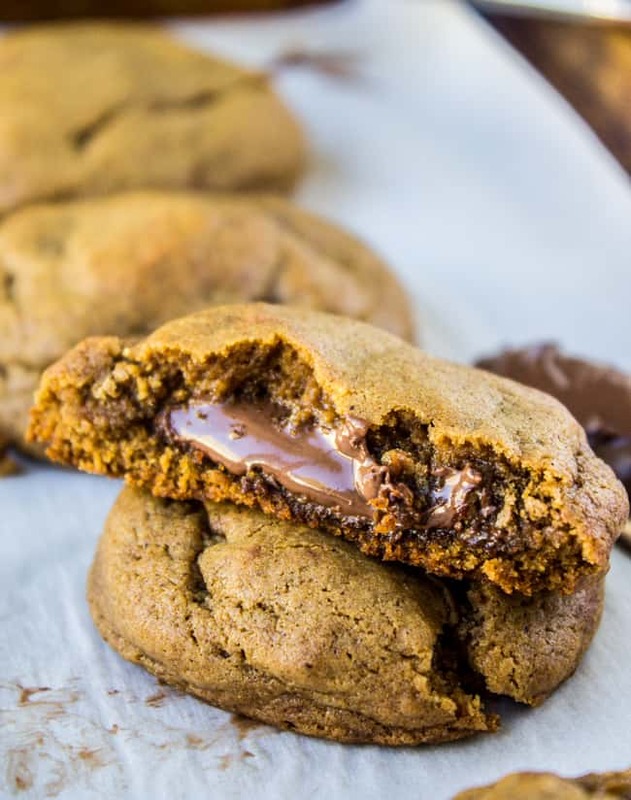 Nutella Stuffed Gingerbread Cookies << so delicious!! 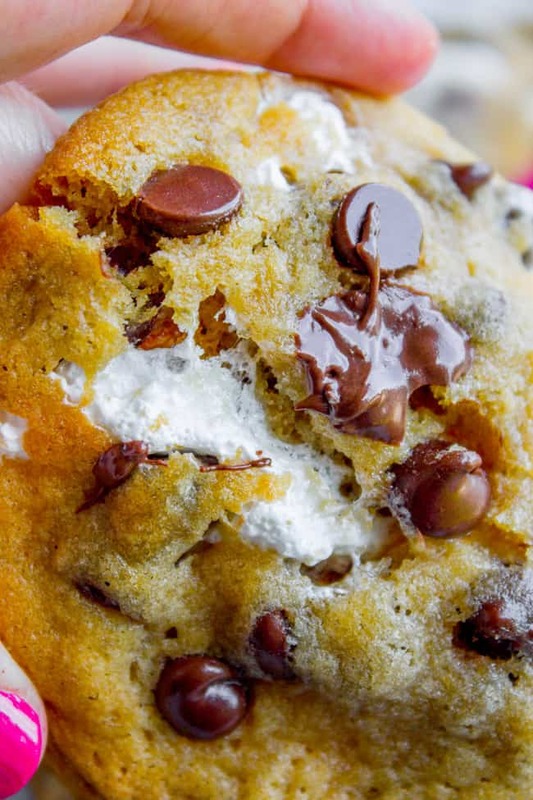 Hot Cocoa Cookies from my friend Glory at Glorious Treats << her most popular recipe! I’m so glad you liked it Leslie! Good to know these work well with refrigerated dough. You know sometimes you just gotta git er done! I’m so glad it was a hit Pat! Thanks for sharing!! My daughter and I made these cookies. They are awesome!!!!! 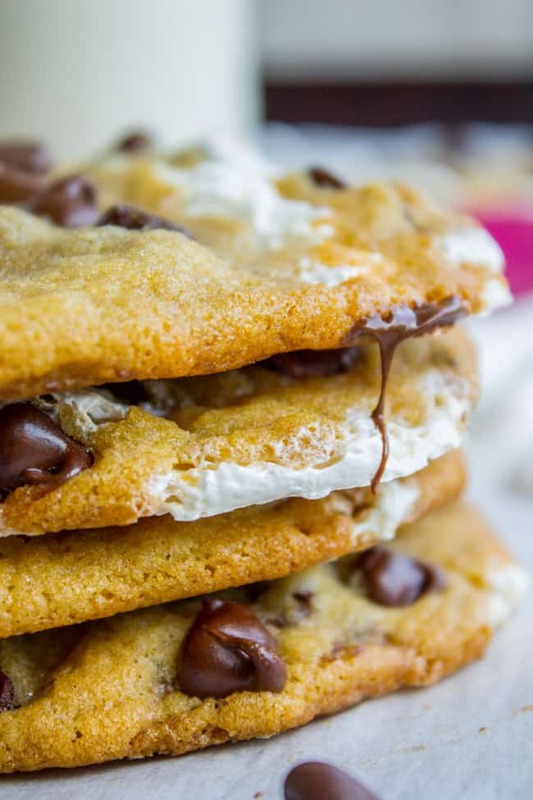 The marshmallow creme adds just enough chewy and they taste so good. Yay!! I’m so glad you guys had a chance to make them Theresa! These are a favorite of mine! Thanks for commenting, I love hearing from you! Made these yesterday. They are delicious! The only problem I had was the fluff flavor got kind of lost in the cookie. We could barely taste it. Any idea on how to make it stronger? Hey Amanda! It’s true, marshmallow is a subtle flavor. You could try making the marshmallow scoop bigger?? 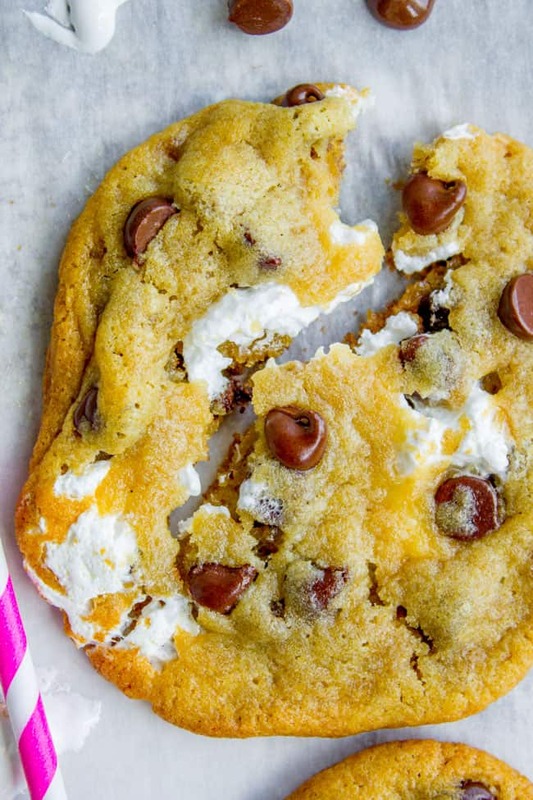 or if you really want to go crazy you could make these as is, but add mini marshmallows to the dough. That would be so good! No promises since I haven’t tested it, and I had so many failures testing this recipe that I’m not actually confident how that would turn out (marshmallows are so finicky!!) Let me know how it goes! The wife made these this weekend… holy smokes! These are delish! Thanks for sharing the recipe! Woohoo! i’m glad you guys liked them! Thanks for the review Mike! Ohhhhh, my go to snack when I “need” to get to the grocery store is graham cracker, Nutella, and marshmallow cream, so when I saw this…I knew!!! 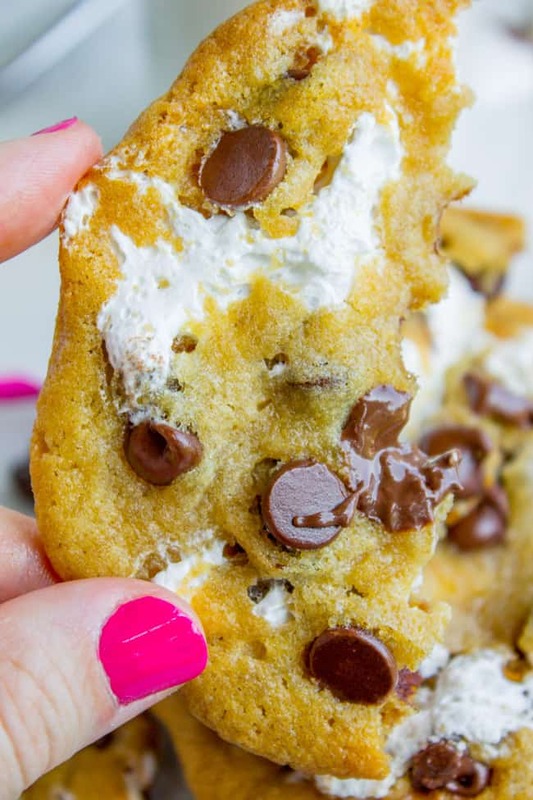 I can ‘t wait to bake a batch of these bad boys….may need to get to the store and get another jar of the marshmallow cream…been hitting that jar a lot lately;) (oh, and “who” seriously makes comments about nails when there’s yummy deliciousness on the screen??? ?….not a serious baker..OR eater or baked goods! Also, marshmallow creme on HOT CHOCOLATE?????? omg!!!! Nun farts???? That is the best ever! googling!! I absolutely love your determination to make these work! They turned out awesome! I cannot wait to make a batch for my peeps! These look delicious! 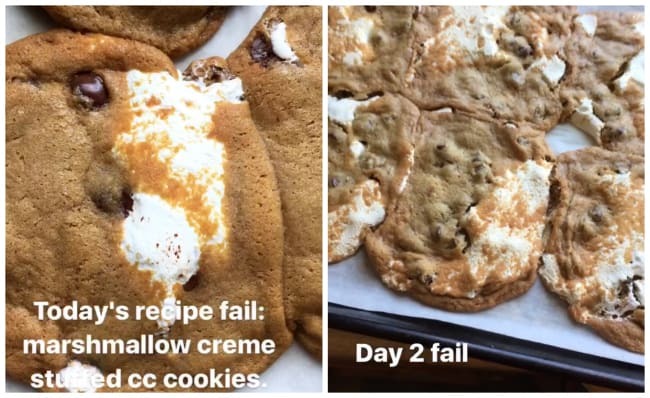 I can relate to your cookie fails- I made cookies with candy canes in them and they all melted together :(. That’s funny that you put yours in milk like cereal. So you’re not alone :)! Oh my gosh, same thing last Christmas Lily! I was making lots of different cookies and had some crushed peppermint in a bowl for another project. I decided to roll my gingersnaps in it (instead of sugar) and then bake. FAIL! They totally melted of course. (I mean. I still ate them.) :) Thanks Lily! 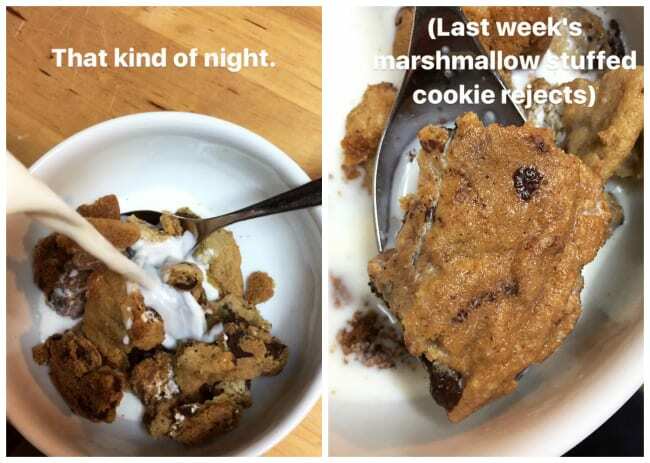 And you totally have to try the cookies and milk cereal! You hooked me with marshmallow creme. 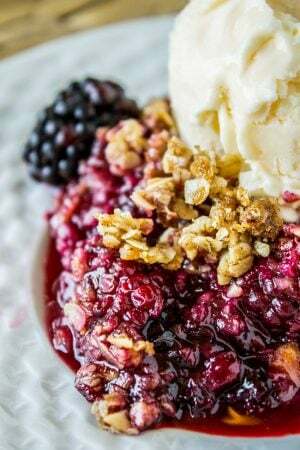 It’s also good on ice cream before topping with hot fudge or caramel sauce. 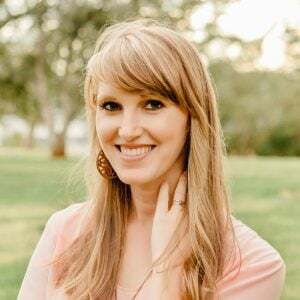 Have you made empty tomb rolls with your kids? We do this the week before Easter. Roll out pieces of bread dough (I use frozen roll dough because it’s already the right size) Wrap the bread around a large marshmallow and seal all edges. Let rest and rise then bake as usual. It’s a craft and snack all in one. What!! Why have I never put marshmallow creme on ice cream!! Ahhhh!! !